First of all the boat trip on Koh Chang is one of the highlights and I highly recommend you to do the trip when you are on Lonely Beach. The snorkeling spots are very good and the beaches you see will be one of the most beautiful you have ever seen. There are different options from 1/2 day boat trips to 5 island full day boat trips. I did over 10 boat trips during my time on Lonely Beach. I recommend the 3 island boat trip which I describe detailed below. But the other boat trips don’t differ that much from the general procedure. Be sure to read the tip at the end of the site! 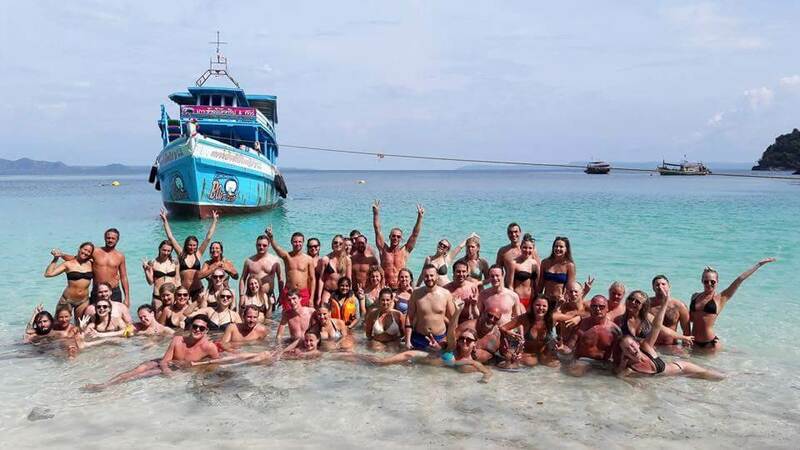 The boat trip: You will be picked up at a location in Lonely Beach at around 09:00am and be brought to the Bang Bao pier which is a 15 minute drive. You walk the pier and enter the boat. It will depart about 09:30am and take about 1 hour drive to the archipelago with over 50 tiny islands in the south of Koh Chang. You will get your snorkeling gear and some information during the drive. After arriving at the first stop which is a little rocky island you go for the snorkeling. You have about 45 minutes to explore this nice snorkel spot and have enough time to swim around the island. Sometimes you have a snorkel guide which shows you around the island and shows you good spots. You will for sure see a lot of different fish and some big swarms. Also some nice corals. If you are lucky you see bigger fish or turtles, but the chance is pretty rare. Back on the boat it’s lunch time. A nice hot meal including egg omelet, fried noodles, rice and a chicken curry. The lunch was always very tasty and you can be sure you get enough food. The next snorkeling spot is just a few minutes away. You will again get the chance to snorkel around a little island and see a lot of beautiful underwater nature. Next stop is the beach. It’s a very nice beach with white sand and crystal clear water on a tiny island. Mostly there will only be the people from the boat and maybe one more boat so it’s not very crowded. You can just hang out, enjoy the water, get some tan or take beautiful pictures. You will have about 2 hours time before leaving. Back on the boat a BBQ snack awaits you while driving back to Bang Bao. It’s a meat stick, grilled corn and some fruit pieces like water melon or pineapple. You really don’t need to bring any more water or food. If you want to drink some beers you should by them before the trip. After a nice chat with other people from the boat you will be back at the pier around 16:00 – 17:00pm and then brought back to Lonely Beach where you arrive around 17:00pm. As I mentioned at the start the boat trip on Koh Chang was one of the best things I did during my time at Lonely Beach. Snorkeling is great! The sea is calm, the water very clear and you will definitely see a lot of fish and many other beautiful things. The beaches are amazing. White sand, not crowded, clear water. One of the most beautiful beaches I have ever seen. The food was delicious and having unlimited water and coffee is nice too. Staff and people I met on the boat trip were also very nice on every single trip. As the trip goes every day and the people know what they are doing it is well organized. I definitely recommend every one staying at Lonely Beach to do this trip! It’s a great overall experience, you will meet many nice people and having a full day of fun. The price is not cheap, but for what you get it is worth it! Water, coffee, national park entry fee, gear and a lot of food included makes the money worth it. Booking: Just go to one of the tourist info at Lonely Beach every one of them will offer you the boat trip and usually it’s all the same trip. Sometimes you can bargain a little bit and compare prices. As the boat trip is every day it usually is enough to book it one day in front. Be sure not to be too hangover when you go on the trip. And as a backpacker at Lonely Beach you should read the tip below! In Lonely Beach there is one place that offers the boat trip as well but with some differences. I highly recommend you to check it out as my experience on this trip was way better as in the normal ones. You are only with backpacker people from Lonely Beach so mostly younger and chatty people fun to hang out with. Also it is limited to 40 people so it’s not overcrowded. On the other trips it can be that you are up to 80 people from all over the island and have a lot of older participants and families with kids or bigger Asian groups. When they see that the first snorkel spot is overcrowded because there are two other boats already they just had to the next one to make sure you have the best snorkel experience. Also there is always a snorkel guide on the boat who shows nice spots and makes funny stuff. On the beach you get a free drink and the group gets together to get socialized so it’s very easy to get to know a lot of other people. 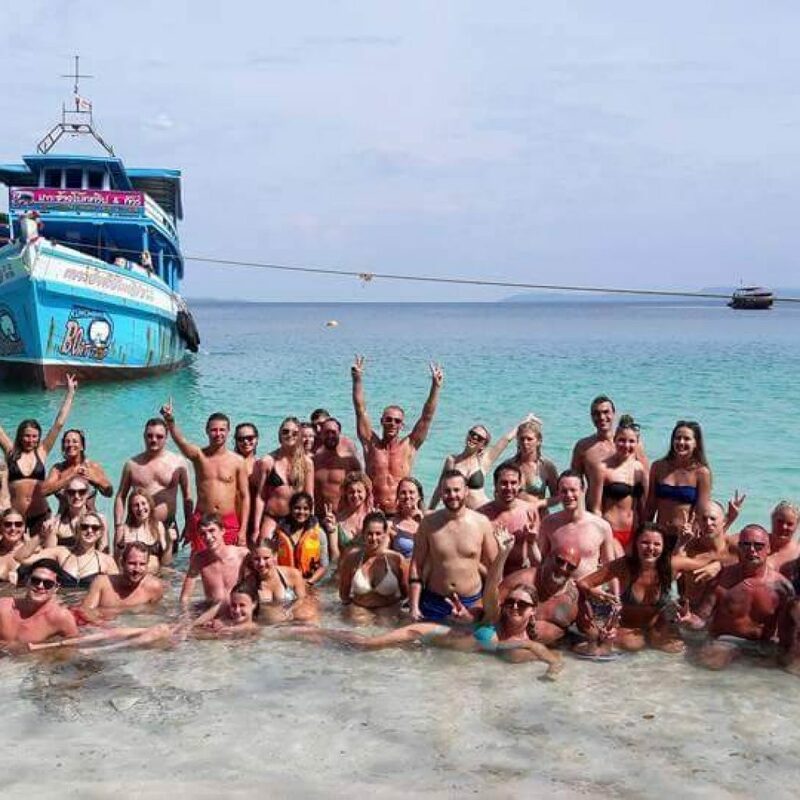 And as they all are from Lonely Beach you easily find some backpackers to hang out with or go to party at the rest of your time at Lonely Beach. The trip is also a bit longer than the other ones and on the way back there is some nice music and everyone has a drink together. Don’t get me wrong it’s not a party or drinking boat, it’s just about having a great time with like-minded people. This trip is not offered every day, only once a week. I highly recommend to you to check out this place and ask for the trip I promise you will not regret it. I was on this trip for 10 times already and every single one was beautiful and I got to know so many nice people that I later hang out with at Lonely Beach. Also the team especially owner Sun is one of the best and funniest guys I got to know at Lonely Beach. Where: Gu Bay Bar at Lonely Beach. Ask for Sun.